There is something about being born in Texas that demands that we love all things western, including movies. The first Hollywood films tended to idealize the strong silent cowboy (think Gary Cooper; think early John Wayne). 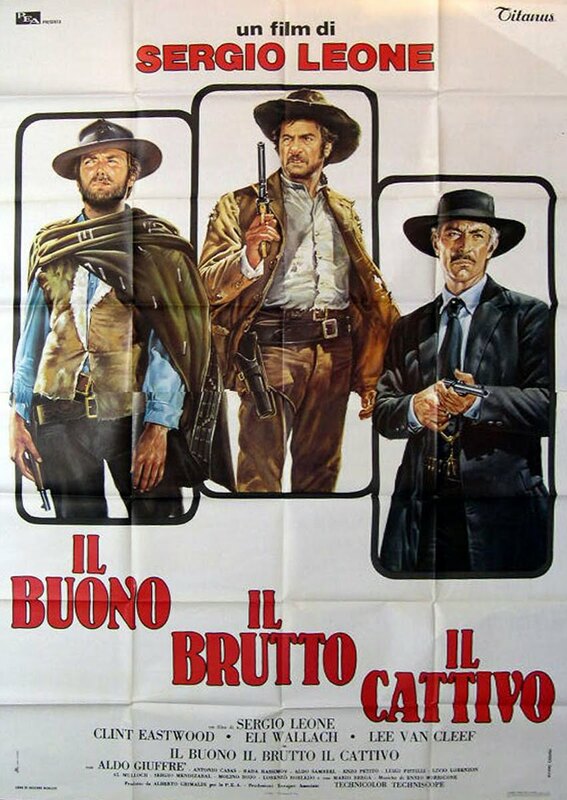 Then in the mid-1960’s, along came the western all’italiana (which we tend to call Spaghetti Westerns). It changed everything. These films starred a sly, often sarcastic double-dealing Anti-Hero, and there was a great deal of violence. This new form aimed at deconstructing the traditional western Hero mythology. Despite this, the movies played to huge success in the States, at least partially due to the popularity of Clint Eastwood who starred in some of the best-known of these Italian oaters. 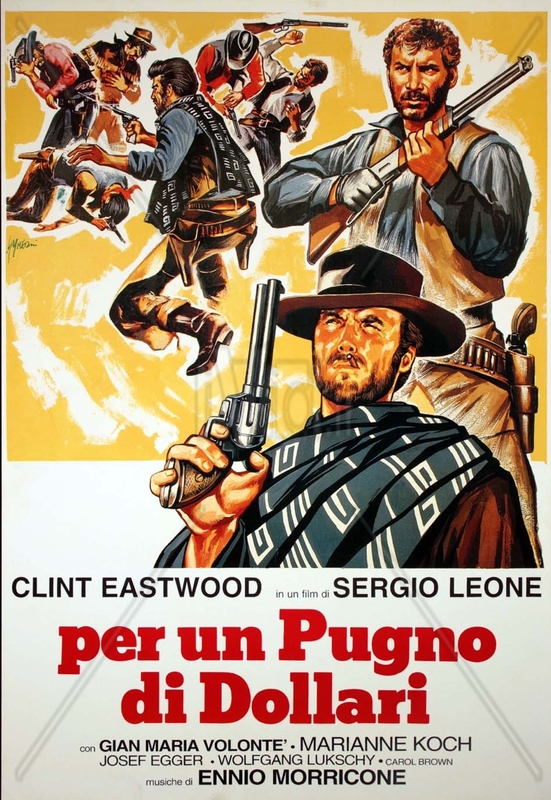 Many resources credit Italian director Sergio Leone for starting the craze (which led to over 600 European Westerns between ’60 and ’80 according to Wiki). Everything was different about this movie – the camera artistry, the music, the play on old classical themes, the titanic struggles between Good and Evil and something that fell in between. Casts were multi-national. The Dollars Trilogy starred Clint Eastwood, who had begun his career on TV and from this series became an American movie icon. A Fistfull of Dollars, For a Few Dollars More, and The Good, the Bad and the Ugly changed the face of western movies forever. For which I for one am eternally grateful. It was after the peak of Spaghetti Westerns that today’s classics began to appear on the screen – beautiful works of art like Unforgiven, Lone Star, Brokeback Mountain, No Country for Old Men, The Assassination of Jesse James by the Coward Robert Ford. Thanks to the vision of Sergio Leone, we continue to get great works of art depicting the heart of the western experience. It is still a mystery to me as to why our western heritage remains so persistent in the U.S. psyche. The gunfighters are long gone; cowboys and ranches have been disappearing, the land shrinking for a hundred years, and yet there is some promise of hope here that we will not relinquish. Although a Texan, I was raised a city girl, and yet I recognize this love of the land and the people who dearly hang on to their way of life. I wrote my first novel WRANGLE about quarter horse racing in South Texas in the 1970s, inspired by my uncle’s Rio Ranch. I write about ranchers and farmers and rodeo athletes in a local newspaper. I blog each week on my website, Jonnie Westerly Notes, about our cowboy culture throughout the States. I adore these earthy western people; their history; their determination to have a future. I think modern films are a paean to their way of live, more honestly portrayed and lovingly presented in the artistry and classical structure of modern films that had their genesis across the ocean in Italy. I enjoyed reading this item. I guess we all have a little bit of “western” in our backgrounds. I can relate to all she said about Texas after living there for nearly 8 years I must admit, I still think about The Lone Ranger and Tonto and Roy Rogers and Dale Evans!!! !